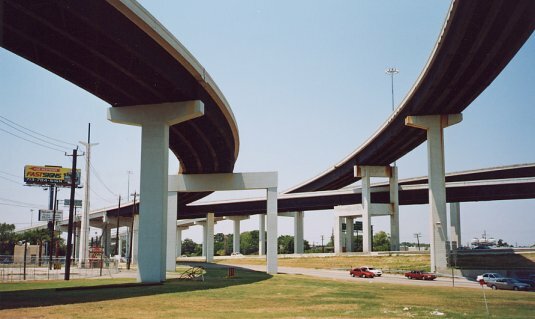 This was the first Beltway 8 stack to be built. The right-of-way is extremely limited, with very little available at the four corners of the freeway intersection. Some of the ramps were built directly over the feeder roads. This interchange will demolished and replaced when the I-10 expansion occurs. 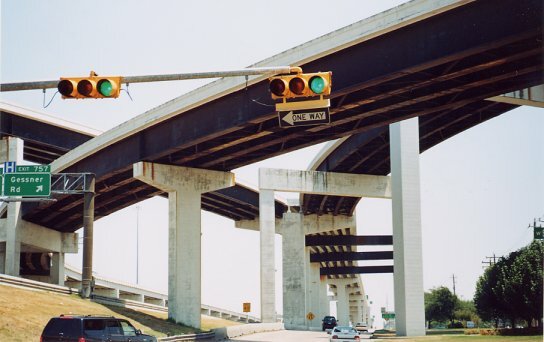 Reconstruction is needed to accommodate the new, wider IH-10. Since the interchange opened in 1989 and reconstruction should begin around 2003-2005, the stack shouldn't last much longer than 15 years. 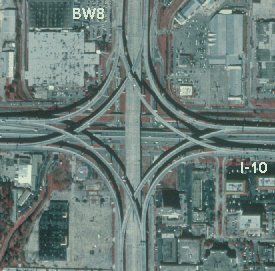 This is an unprecedented short lifetime for a major freeway interchange. Looking towards the northwest, with the EB I-10 feeder in the foreground. The peeling paint and rust stains on the piers are somewhat unsightly. Looking east along the EB I-10 feeder. The connector ramp is positioned over the feeder. Looking north along the Beltway 8 main lanes.